Beginners are often drawn to the band by the prospect of getting a shiny new instrument and being able to play some of the music they recognize. Within the first few weeks the novelty of the instrument wears off and the beginner realizes that learning to play requires work. At that point all the skills and tools of a talented director are needed to hold the student's interest. The period between the first and fourth months are the most critical for beginners. During that time a director must be inventive to maintain enthusiasm and motivation to practice. After about the fourth month, beginners have learned to play enough to make it enjoyable and fun. Among the ideas and materials you can use during that critical period to increase retention are a letter to parents to enlist their help; a progress report with space for compliments and some encouraging words; achievement certificates; and a beginner band concert. Especially when band members are relatively new to the group, it is incredibly important to keep communication open, upbeat, and fun. 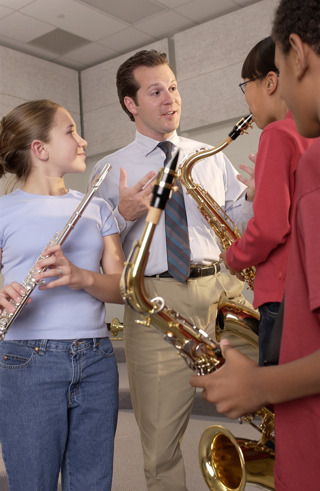 Since kids today have busy schedules, filled with many extra-curricular activities, homework, and other obligations, it is important to remind band members that they bring value to the group. Achievement certificates can revitalize students' enthusiasm and also serve to increase parental support. These certificates can be given at any appropriate point. A recommended timing in order to combat waning enthusiasm is 60 days after the beginner class starts. The "Answers to Questions" sheet can also be given at that time. Contact us and we'll be happy to provide achievement certificates for whatever musical purpose you like.